At Sovereign Home Improvements we can build any sort of extension that you wish for your home. Many people like conservatories in Essex and consider adding them to their home because they are just so wonderful to relax in all year round. The conservatories of 20 or 30 years ago were frequently too hot in the summer and too cold in the winter, but today we have energy efficient materials and we have solar reflective glass. 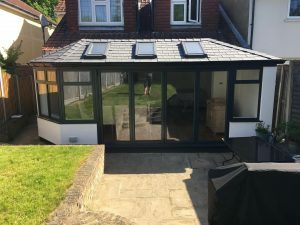 Your conservatory can be built using this glass so that it doesn’t overheat in the summer, and it can be heated along with the rest of your home so that you can use it in the winter. Yes, you can sit there in February with the snow on the ground, and on your trees and shrubs. Enjoying the views of your garden as much as you did in summer when the solar reflective panels in the roof kept too much heat out and you had the doors open to admire the roses. However, they tend to have brick bases that match the home, with the upper portions entirely of glass so that you can – if you wish – grow an orange tree or lemon tree in them! That will be something to brag about when you have your friends round for dinner! We also build all other types of extensions in Essex. You might want a home office, as many people do these days since more and more of us are working online, but you need to be away from the kids in the holiday time, or just need a quiet place to escape to. If you need your own quiet space in which to work and think, a home extension that you can use for your office is the ideal solution. At Sovereign Home Improvements we are experts in supplying and installing double glazing in Essex. 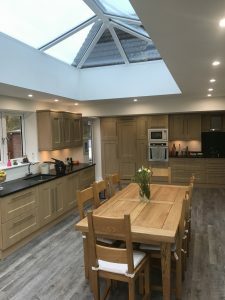 We also supply and install all types of doors along with conservatories and orangeries, and we also install soffits and fascias and flat roofs. However, the bulk of our work is in the installation of double glazing. We are a family firm and a small team working together, rather than one of the big national companies that spend a fortune on advertising, which in turn means that their products are more expensive. 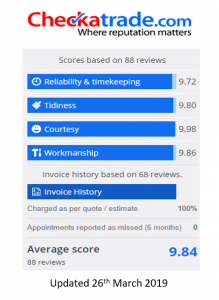 We aim for top quality at a fair and affordable price and we treat our customers in the same way we would wish to be treated ourselves. If you are looking for gimmicks and special one-off discounts “as long as you order right now” you won’t get them from us.